"We saw his star in the east and have come to worship him" Matthew 2:2. The word chrismon is a Latin word for Christ-monogram, meaning a symbol of Christ or Christianity. The free ornament pattern listed here is for individual or classroom use. It is not to be sold or distributed without written consent. Copyright 1993 S.A. Keith - All Rights Reserved. The pictures and directions, below, are of the "Two Doves" ornament being cut. However, the process is the same for all the patterns. Click here to watch a video. Print the FREE Star Within A Star Ornament pattern. Try this! Print the pattern on a specialty paper such as white linen or Japanese specialty paper with gold flecks. By enlarging the pattern you'll make it easier for younger children to cut it out. Using a small sharp pointed scissors, cut out the large square pattern. With design facing up, fold the square pattern in half. Cut along the gray lines, carefully cutting out the gray shaded areas. Punch holes (except for the Star Within A Star pattern). Unfold carefully. There will be an inner design and an outer design. With pattern lines facing away, push the inner design away from you and press the folds to conform. Now pull the outer design towards you and press the folds to conform. This will give your ornament it's three dimensional look! Spray coat with a clear coat to make it more durable. You can also spray it with a white pearlescent spray or gold leaf it for a unique effect! Look what you can do with just one book of our Christ-filled ornaments! Decorate a 6' Christmas tree. 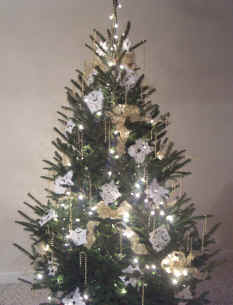 Chrismon trees are decorated with white and gold adornments--white represents purity and gold for the glory of God. The greenery of the tree reminds us of everlasting life. Making Chrismon Snowflakes is spiritually meaningful and fun for the entire family! 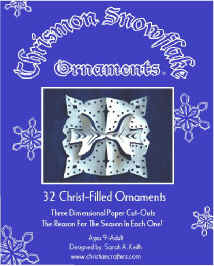 Have even more fun with our book of 32 Chrismon Snowflake Ornaments. Ornament designs include: angels, butterflies, crosses, crowns, doves, fish, hearts and stars; for ages 9-Adult. Don't miss our other Christmas, Advent, and Holy Day resources.